Donna William‘s, one of our Bristol Human Library books wrote a blog about her experience for The Limping Chicken – the UK’s independent deaf news and deaf blogs website. With their permission we’ve reproduced it here. Full blog, which has many interesting reader comments, is at http://limpingchicken.com/2013/12/02/human-library/ – thanks Limping Chicken for letting us copy it! On Saturday 16th November, I had the privilege of being a part of the Human Library. The Human Library is a project, now a global movement, that seeks to challenge stereotypes and encourage dialogue. The idea is simple; a ‘reader’ can go into the Human Library, browse a catalogue and borrow a ‘book’, the twist is that the ‘book’ is a living, breathing individual with a story to tell. Books are volunteers, drawn from as wide a background as possible, reflecting various cultural, religious and ethnic identities as well as differing viewpoints – in short, people who can be misrepresented and misunderstood. It was an experience that I’d really been looking forward to, as it is a brilliant idea for a public Art project and a great way to challenge prejudices and ignorance through dialogue and sharing. As a ‘book in translation’, my translator was the inimitable Kyra Pollitt. My reasons are simple; I feel like this is a hearing world, made by hearing people for hearing people, and rarely does it enter their pretty heads that non-hearing people may actually want to be part of that world too. When confronted or challenged by a non-hearing person, the reply is usually ignorance, confusion and downright lack of will to be accessible. If something’s too difficult or inconvenient – excuse me, ‘not within reasonable adjustments’ – then they won’t do it. I realise I’m generalising here, and there are some lovely, amazing hearing people out there, who have done everything they can to make their world a little more accessible for me, to whom none of the above applies. Unfortunately, they’re in the minority. For the most part, “it’s not in the budget”, “it’s not our department”, “we’ve never had a complaint before”, “we hadn’t considered that” and “it’s not within our means” are apparently perfectly acceptable replies to requests for access. Even three years after the passing of the Equality Act 2010. A fig for the Equality Act. In short, hearing people may think I’m ignoring them – and I’m been pushed aside and glared at more times than I can count, and on one memorable occasion, physically assaulted because I didn’t hear someone telling me to get out of their way – but I firmly believe that it is the hearing world that’s ignoring me. Look at all the fun things that hearing people get to do. All the art talks, the poetry slams, the big sci-fi blockbusters at the cinema, the theatre shows, the BBC Dr Who website official video clips, book readings, conferences, painting classes, community adult learning courses, etc, etc. Take a good look at all the fun stuff there is for geeky artistic writer poet types like me. How much of it is subtitled / interpreted / accessible? Take it from me; very little. And as previously mentioned, responses to someone emailing to enquire about accessibility requirements are often unenthusiastic, to say the least. The Human Library, amongst other things, was very therapeutic. I was able to explain why I’m so annoyed by society on a daily basis and I hope I was able to raise awareness just a little. I told stories about my experiences, discussed the finer points of using interpreters, explained why ‘hearing impaired’ is a controversial term, as I believe it doesn’t do a deaf person’s mental health any good to be regularly described as a ‘broken normal person’, and generally submitted myself for questioning. I’m pleased to say my ‘book’ got a lovely review! It was interesting to note that a lot of ‘readers’ didn’t seem to know what to do with the interpreter; they gave her sidelong glances, hesitated and just seemed a bit lost. This simple introduction and little jab of humour served to break the ice and gave a quick crash course in BSL interpreter etiquette. After this, things went smoothly. I suppose it should have been obvious to me that using a BSL interpreter might be totally new to them, but for me using an interpreter is completely normal. And as I thought about it, I realised I’d fallen into the same trap that hearing people do – just not thinking about it beforehand. Interpreters are a fact of life for me. An essential one. In short, so much a part of my normal interaction that I forgot that actually, quite a lot of people out there have never used one before, and might need a gentle intro. In the same way, hearing people who’ve never met deaf people before and never considered a deaf person might turn up at their event / conference / talk can’t always be expected to know what to do when it happens. And bless them, all the ‘readers’ were lovely, if a little nervous, and I know I regularly broke the time limits (sorry, librarians!) but I was having such a good time talking to them all. I really feel we all took something away from it; they got an insight into my world and I got an insight into theirs. It’s a hearing world made by hearing people for hearing people. I’d like to think, based on my experience at the Human Library, that if only we could raise awareness of deaf people and our needs, that things would drastically improve; barriers most often are not thrown up out of malice but out of blissful ignorance. The more we can do to challenge and break down these barriers, the world will be a far better place. 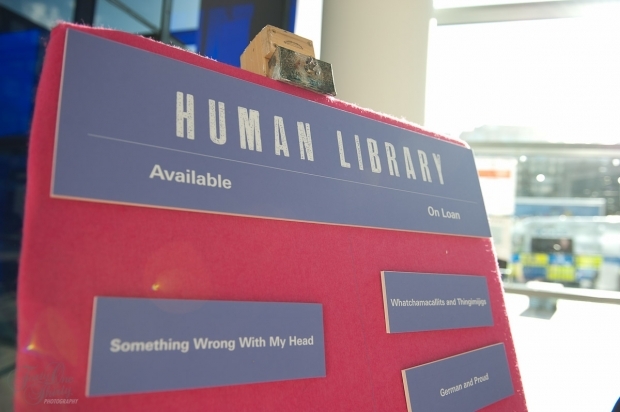 The Human Library is a brilliant way to do this; giving people to opportunity to meet and learn about different people’s viewpoints in a creative and open environment. I had a really good time, and I really feel like I made a small difference. I’d definitely be up for doing it again, and would encourage any deafies out there to apply to be a book if the Human Library comes their way. And the icing on the cake? The other books, librarians and organisers had got wind it was my birthday weekend, and ambushed me at the end of the day as I waved goodbye to my last reader with a little fairy cake and candles, which was carried at the front of a small procession and placed on a table in front of me before they all launched into a very passable BSL version of ‘happy birthday to you’. It was amazing; they’d all taken the effort to learn the words in BSL, apparently been teaching each other through the day, and gave me a brilliant birthday surprise to wrap up a great day! Thank you all, so much, it was really lovely and touching and a fantastic surprise! In summary, the Human Library; fantastic idea, fantastic aim, fantastic people. Long live the Human Library!